Toyota Racing Division, the performance-oriented in-house tuner of the Japanese car manufacturer, has participated in the recently concluded 2019 Chicago Auto Show with as many as four show cars. You’d think the guys would have nothing left to reveal at the Osaka Auto Messe following almost immediately afterwards – but you’d be wrong. 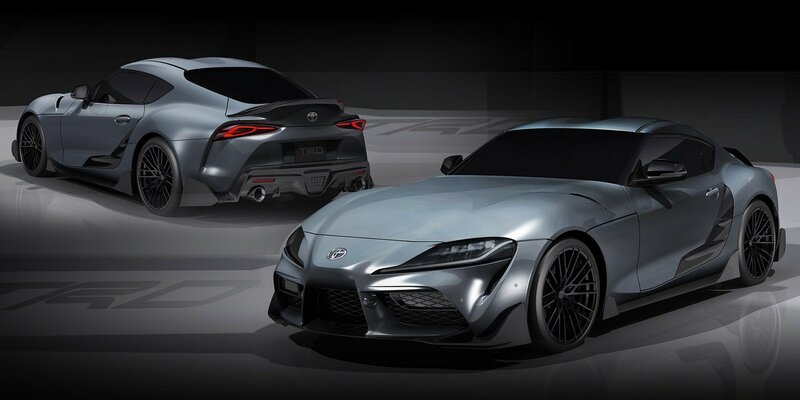 Enter the 2020 Toyota GR Supra Performance Line Concept, an early take on the revived Japanese sports car. The package includes an improved carbon aerodynamic kit consisting of a front spoiler with canards, side skirts, decorative door moldings, rear spats, and a trunk spoiler. The 2020 Toyota GR Supra by TRD also boasts a set of lightweight 19-inch forged wheels clad in Michelin tires. The drivetrain of the car remains stock so far. This means it is still available with a 2.0 V4 rated at either 194 hp (145 kW) or 258 hp (192 kW), depending on your chosen modification, and a hi-end 3.0 V6 capable of 335 hp (250 kW).